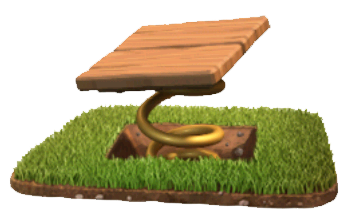 The Spring Trap is one of many Traps in the Clash of Clans game. This bouncy little number will toss unwanted visitors right off your property! ​Causes instant death to the first group of enemies that step on it, bouncing up to 15 housing units of Troops. For example, it will bounce 15 Archers or 3 Giants. Cannot affect a P.E.K.K.A because of her heavy armor. Similarly ineffective against Golems and Heroes. 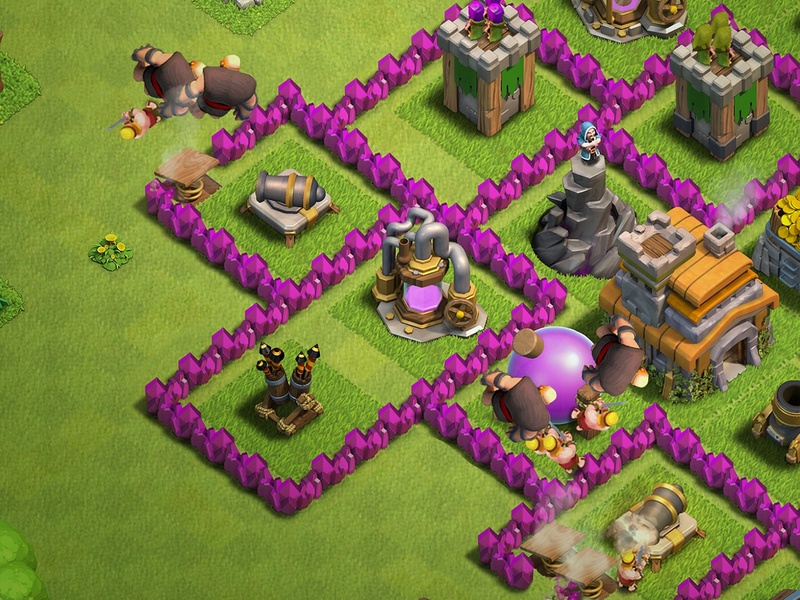 P.E.K.K.As and Golems are unaffected due to the fact that they take more than 15 housing space. If put in a strategical way, Spring Traps can ruin a raid, including the infamous Giant–Healer combo. The Spring Trap often does not affect the Goblin either, but this is because the Goblin is too fast for the Spring Trap to bounce it away (it usually is able to move out of range before the Spring Trap has the opportunity to affect it). However, if the Goblin doesn’t continue moving once the Spring Trap has been triggered (stopping to attack a Resource Building, for instance), it will be bounced similar to a Barbarian or Archer. Also, if there is a horde of Goblins, the Spring Trap will bounce the Goblins in the back, since the Goblin in front triggered it first. The Spring Trap is the only Trap that can?t be upgraded, besides the Pumpkin Bomb and the Santa Strike, which aren’t available anymore. Since the Spring Trap doesn’t actually do damage to Troops, troops bounced away by them will make neither upon-death skulls nor tombstones. If you look carefully, the Spring Trap’s range actually extends out just enough to see the range circle. Helpful to put near or around the Town Hall, so you can get rid of large numbers of Troops closing in. A sound strategy for Spring Traps is to place them in an intentionally-designed wall gap. As Troops will generally tend to go through the gap rather than fight their way through the Wall, they will be directed right over the Trap and be bounced to their death. Remember, however, that Spring Traps are one-time-use and until being re-armed it will leave an undefended gap in the Wall after an attacker has triggered it. A modified version of this strategy is to place Walls inside your base so that the enemy Troops have to walk over the Spring Trap to attack nearby Buildings. 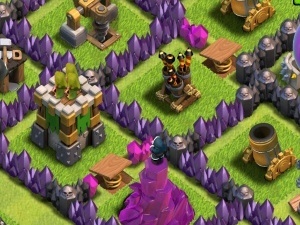 You can place them in between Defensive Buildings to take out Giants or place them in between Resource Buildings to take out Goblins. – Tapping this icon displays information about the trap, such as Type, Level, Re-arm cost, Damage Type, Favorite Target, Targets, etc. At the bottom of the screen briefly describes the principle of its action. – Tapping this icon re-arms the current trap. This icon is only displayed after your Trap has been triggered during an enemy attack.